Hand embroidery can be a bit daunting if you've never tried it before. When using old retro designs, there is no colour pallette already decided for you and you also need to decide on the types of stitches to use. Plus, there is the whole issue of transferring the pattern onto the fabric. All of this takes some thought and some preparation. Another challenge in hand embroidery is transferring the design. There are so many ways of doing it. Recently, I ordered the prick and pounce set from Berlin Embroidery. After a lot of reading, it seems to me that this is probably one of the oldest ways of transferring a design and it looks like it still gives a crisper transfer. Pictured above is everything needed for using the Prick and Pounce method. A steel pricker where a chenille #10 needle is inserted, a pouncer which is more or less a piece of wood that has pieces of felt attached to each end, a container of pounce dust and a Bohin retractable pencil that uses chalk instead of lead. The kit includes white and grey leads and I chose grey pounce dust. I also ordered an extra package of needles because these ones seem pretty hard to find around here and a yard of cotton muslin that has a higher count than what I can buy locally. The fabric is without those little puckery flecks that you get in the muslin that is used for sewing. According to Tanja Berlin this fabric is ideal for thread painting, which is what I would really like to try and it also makes a good backing when stitching on fabric that might be a bit too flimsy for hand embroidery. So, last night, I pulled out all of this stuff to give it a go. I searched the pictures in the Hoop Love Group on Flickr (which is an amazing source for out of print retro transfer patterns that do not violate copyright policies). I decided on a modern looking teacup pattern. The next step is to take a heavy piece of tracing paper and copy the design onto it. It is recommended to use Vellum paper, however, it's very expensive and difficult to find. Vellum paper is a natural paper made from animal skin. My kit came with a small piece of it, which I decided to save for later. I used Dura-Lar instead. This stuff has a plastic feel to it which makes sense since it's synthetic. It isn't cheap either (around $25 at Michael's), but more affordable than Vellum when you use a 40% off coupon to buy it. It has the same level of transparency as Vellum and it is about the same weight, maybe a bit heavier. The difference between the two is that Dura-Lar is extremely smooth and the Vellum paper has a bit of a grain to it which makes it stay in place better. Also, I think it would be easier to pierce the Pricker needle through Vellum than the Dura-Lar. Once the design is drawn onto the transparent paper, you set it onto a towel or two and pierce holes on the lines all the way around the drawing. The more holes pricked into the paper means the lines will be more complete because more pounce powder will fall through the holes. Below is the result. The next step is to attach the drawing onto your fabric. I attatched it with pins. Then lightly dip the felted end of the pouncer into the powder and rub it over the holes in a circular motion. This pushes the powder through the holes and onto the fabric. The very final step is to take the Bohin pencil and connect the dots on the fabric left by the pounce. As you can see below, this process gave me a very crisp pattern on the fabric. Since I haven't actually tried an iron-on transfer, I can't really compare. However, I think this turned out well and aside from it taking awhile to prick the pattern into the paper, it is fairly simple. I do understand why the iron-on transfers are probably more popular since it is probably a lot faster and not as messy. The pounce powder is very fine and definitely a little messy. Now it's time to stitch! Since I was testing this whole process out, I decided to put the pattern on a couple of little tea towels that I made a couple of years ago. I always planned on embroidering something on them. 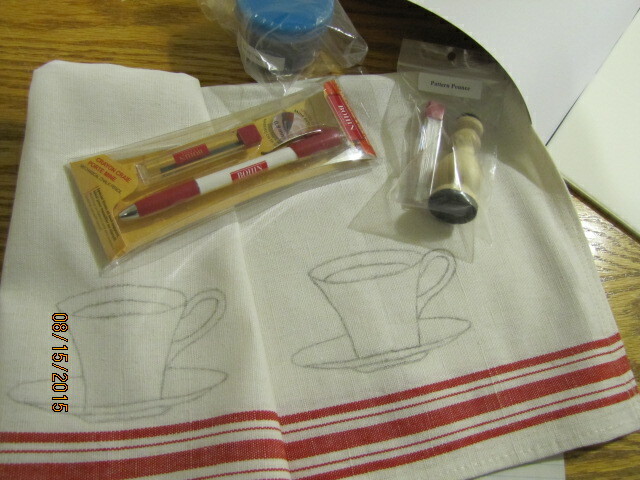 I simply stem stitched around the cups with Perle Cotton #8 in red (DMC 321). This was a fun little project that was completed from start to finish in one evening. My stem stitch might need a little bit of work, but I think the towels turned out pretty cute. Wow, you learn something new every day! I had never heard of pounce powder before. Your redwork tea towel is fabulous, as is your stem stitch. I'm not sure I would have the patience to do the prick-and- pounce method of design transfer, though.